As we wrote earlier, Netvibes CEO Freddy Mini demonstrated parts of Wasabi at our first Realtime CrunchUp in July. In addition to the traditional widget view, which breaks up your feeds and applications into a grid of boxes on your Netvibes homepage, Wasabi now also has a “smart reader” view. The smart reader borrows from traditional RSS readers in that all the feeds and widgets you subscribe to are presented together in one column, updated in reverse chronological order. You can see just a list of headlines, or an expanded view with the full feed. 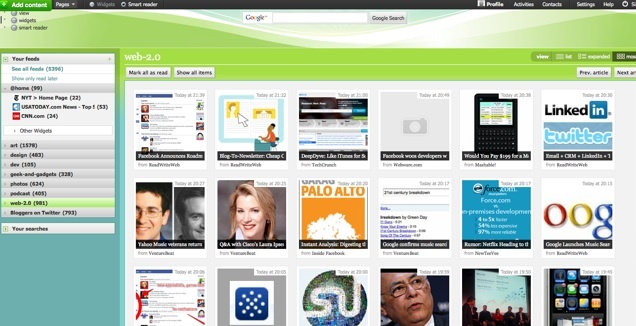 It looks similar to Google Reader, except that Netvibes supports more than just RSS feeds. You can import your Twitter and Facebook streams (read-only right now), as well as Gmail, Yahoo Mail, Flickr photos, weather widgets, stock widgets, and more. Plus, Wasabi has also sped things up to make the stream as realtime as possible. It is caching content from the most popular feeds and pushing that down to users as soon as there are any updates, and it will also be supporting both the Pubsubhubbub (PuSH) and RSSCloud standards aimed at eliminating the lag time inherent in RSS and Atom feeds.